Rooting a phone means getting the root permission to your Android device, take you to enter the Android world and non-approved applications and hidden features. Many people think that implementing rooting process is expected to be difficult and hurt to the device, but AnyRooter Say "NO", It does a great job in Rooting an Android with simple operation, safety and reliability. It make this process easy for the vast majority of Android devices out there. Easily root a device with 'exploits', never harm your device and data loss. Safe! No need boot loader, just enable USB debugging and connect to your PC. Easy! Fool-style operation, the best choice for novice friend! As of the Android Rooter program 5.0 release, rooting a device for novice is no longer unreachable concept, the AnyRooter software provides each Android users with the easiest one-click solution to root any Android devices. Every Android users have the right to enjoy the all non-approved features that limited by its manufacturers. Only 4 steps you can control your Android devices and access to hundreds of new and exciting features. Connect: Pluge your Android device to your computer via USB cable. Recognize: Detect your device and install the drivers automatically. Backup: Give you option to back up your personal data to PC before rooting. 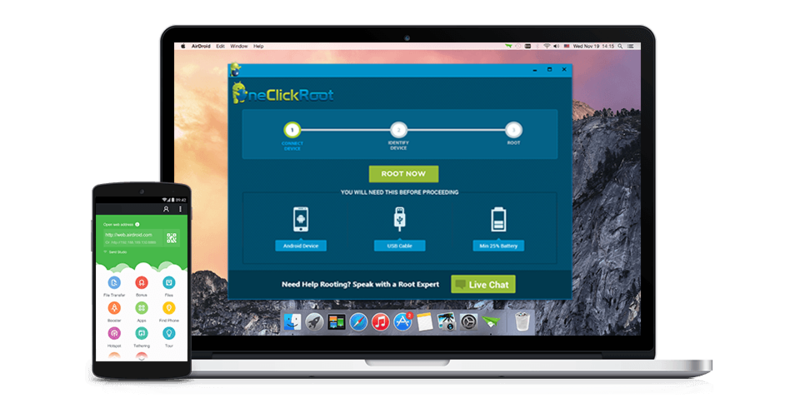 Root: Just one click to root your device without losing any original data. In the past, there is no single standard way to root every device despite rooting is a simple process. But today, AnyRooter Studio redefine the rooting standards - easy, fast and safe! Our technical team repeatedly tested all other rooting programs that claim to quickly and safe root, however, the test results is not as fast & safe as they described. Conversely, AnyRooter is far more user friendly, fully be Compatible with a wider range of any Android devices running Android 2.1.X or higher, because we focuses on using “exploits” to root a device. You can get access huge number of inactivated features and 'incompatible' apps, that were hidden by manufacturer. You can easily install or upgrade a new OS version that has not yet been released for your Android phone. Rooting your device is the best way to block any ads in any apps installed on your device. Rooting will let you get more power, easily install apps like Greenify to automatically lock the unless apps. Rooting allows you to remove all apps that manufacturers built in, overclock your phone for better performance. • Can AnyRooter Program Damage My Phone and Data? • How Long Does It Take to Root My Android Phone? • When I Root My Device, I Get the Error Messages.